It’s been awhile since I’ve posted any recipes. My camera was acting up and developed a lens error which prevented me from taking pictures. It took a few weeks to send it off and get it back in working order again. Then the holidays were upon us and I had my hands full with no time to blog. I’m just getting back in my groove and wanted to share one of my favorite pot pies with you. Pot Pie is a favorite of mine, however my hubby Joe doesn’t enjoy my enthusiasm for pot pie. So I compromised and made a pot pie with minimal dough, just a crusty puff pastry dough on top. And I added some spicy chicken and veggies that we both love, roasted corn, green chile and red onion. It had all the flavors of home and it couldn’t have tasted better. They were made in individual ramekins, just the perfect size to heat up for a quick lunch or have for dinner with a side salad. This year Joe and I have gone to several fall festivals around town. We’ve been to Irish Fest, the Plaza Art Fair and Old Settlers Day. It’s a great way to spend a day at any of these events. 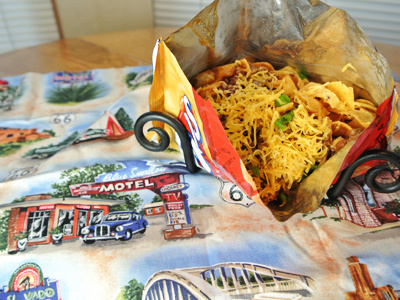 We’ve had some great festival food which got me craving a NM favorite Frito Pie. Frito Pie is a staple at most festivals in NM. We eat it straight from the bag and the chili has to be New Mexican. It’s traditionally served with grated cheese and onions upon request. When I make it for myself, I like to add some shredded lettuce and diced tomato to the mix. It’s Muy Bueno! I’d like to give a shout out to the ladies at the Desert Rose Center in downtown Tucumcari, thank you for the beautiful Route 66 swatch of material. It goes perfect with my NM Frito Pie! Another discovery from “Great Day Cafe” is their Cheeseburger Soup. Their daily soup menu changes day to day but you can always be sure to find a tasty bowl listed on the blackboard. My version has a few differences, however. Great Day Cafe cooked diced potatoes in their soup where as I like crisp fries on the side. 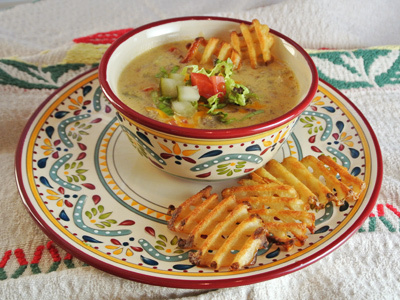 Waffle fries are perfect to dunk in this soup and also as a side cruncher. To give it some New Mexican flavor add some green chile, which is purely up to you. Don’t tell Great Day Cafe, but I think I like my Cheeseburger Soup slightly better than theirs. That won’t stop me from going back, I feel inspired every time I visit their cafe! In the mood for some meat and potatoes . . . 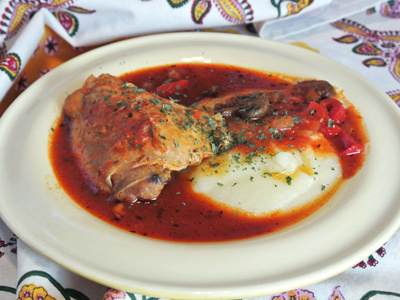 I found a recipe for Latin Pork and Potatoes in the local paper that looked intriguing. 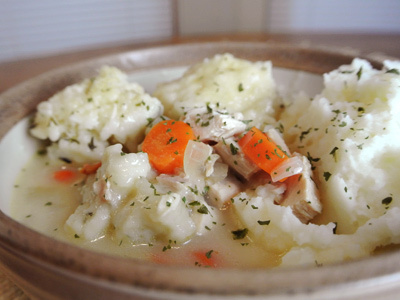 It was an easy one pot meal but the list of ingredients seemed to be a bit on the bland side. So I changed it up subbing in chicken thighs for the pork chops and adding salsa flavors to the pot. 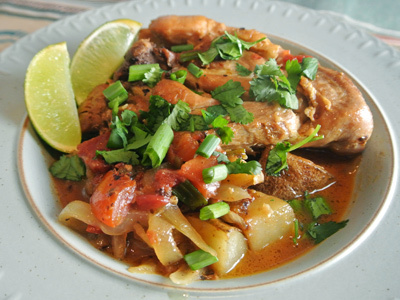 It was an amazing blend of flavors with chicken so tender and juicy surrounded by potatoes, onions, green chiles and garlic in a brothy tomato base. 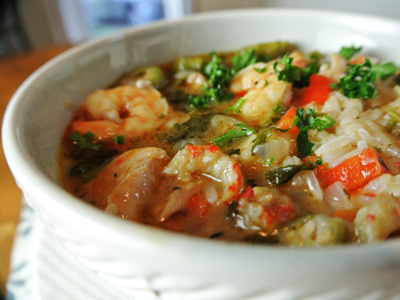 It made a hearty meal with a hunk of french bread on the side to sop of any leftover juices. I have been looking for a curry dish to try out and found a great soup recipe that sounded like it would fit all our taste buds. In full disclosure, my soup turned into a noodle bowl as I made it up ahead of time and let the noodles sit in the broth for about an hour before serving. 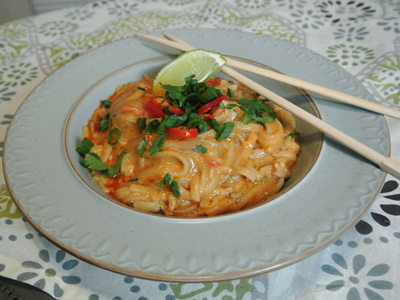 The noodles absorbed most of the liquids to make a thick saucy noodle bowl. So if you want a soup dish, serve immediately. In the end I learned that even though my dish didn’t turn out as expected, the flavors remained intact and it made a most delicious bowl. Traditional New Mexico Posole is a rich hearty stew made from red chiles, pork and dried corn also known as hominy. 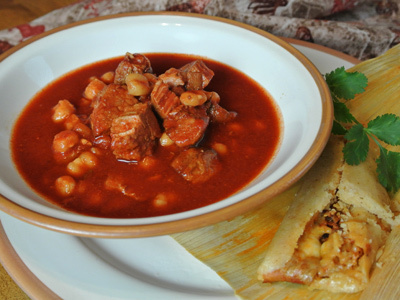 Most New Mexicans have a bowl of posole and tamales during the holidays between Christmas and New Years. I will miss being in NM for the holidays, seeing the lighted luminarias and the aroma of chile in the air which is breathtaking this time of year. But I won’t miss out on having a comforting bowl of posole with a pork tamale. This year I made a more traditional red chile posole and it was so good, it reminded me of home. Have a wonderful holiday everyone!